There’s a new pattern in the Crochet Spot Store! 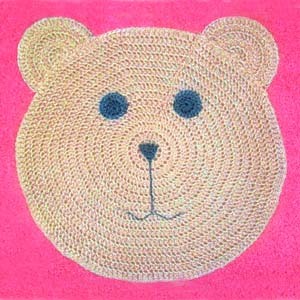 If you are looking to decorate a nursery or child’s room, the teddy bear rug is a great fit. Boys and girls will love it! Textured yarns can kick it up a notch and give it a more carpet-like look. This rug is a great project for fuzzy novelty yarns, such as boucle or eyelash yarn. This rug is a fun addition to any kid’s room. The teddy bear can also be used as a hanging decoration instead of a rug. This entry was posted on Sunday, June 9th, 2013 at 11:14 AM by Candace	and is filed under Best Crochet Patterns. You can follow any responses to this entry through the RSS 2.0 feed. You can skip to the end and leave a response. Pinging is currently not allowed.